Yesterday was supposed to be the Kids Cook Monday, but it ended up being "Go out for yummy Thai food with friends" Monday. And we all really love Thai food! I did make lunch for the kids, and took advantage of a little bit of leftover calzone filling from the other night. It's a bit of ground turkey, seasoned with garlic and Italian seasonings, a bit of garlic/herb cooking creme, some parmesan, a bit of red sauce, a few handfuls of cheese, really just bits & pieces of what was in my fridge, but so yummy! For lunch, I stuffed mini pitas with the aforementioned filling, which kind of gave a calzone effect. (I used to make biscuit calzones frequently, if you look back to 2007 and 2008 posts; I really should do that again!) 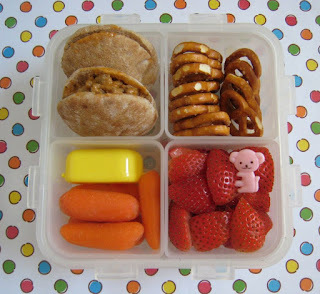 To go with the calzones, the kids had pretzels, strawberries and carrots with dip. Today's project is to go buy fruit, we are out again. I swear, we go through scary amounts of fruit around here! Just wondering where you got that little yellow container, and does it leak? I need something like that for my kid's lunches. Mini pitas? Did you make them yourself or did you buy them somewhere? Nice variety here. I like it! Lovely. I must find mini pitas now!